Posted on September 30, 2014, Clifford D. Mansley, Sr.
We hand letter resolutions, certificates, poems or quotations on fine cotton rag paper or calfskin in your choice of Lettering Style. Explore prints for sale, Cliff’s gift collection, and commissioned work. 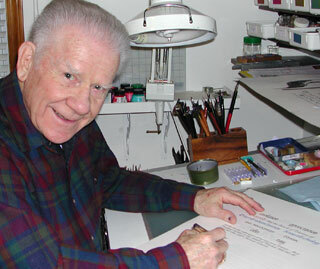 Cliff Mansley is a second-generation penman in Lake Oswego, Oregon. 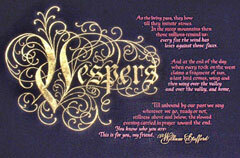 For over 30 years, Cliff has fulfilled hundreds of commissions from a few simple words on a mat, to elaborate testimonials, poems, and scripture verses. Using fine art papers or calfskin with special inks, watercolors and gouache, Cliff's calligraphy is often highlighted with 23-karat gold leaf or palladium, and 24-karat gold paint. Cliff, who studied at the Zanerian College of Penmanship, and his wife Jean, a graduate of the Moore College of Art in Philadelphia, have created and sold numerous prints. The popular As For Me and My House, (Joshua 24:15), has sold more than 170,000 copies. 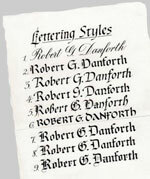 As Cliff turns 90, he has decided to no longer take on commissions, but will continue to offer his Master Copperplate Script correspondence course. You are welcome to communicate with him at . Prints and Originals of Cliff’s work are available to view or purchase on daughter Holly Monroe’s website. Holly, who combines the artistic ability of her mother and the lettering discipline of her father, is one of the foremost calligraphers and illuminators in the nation.